Parrots kept in captivity can be at risk of becoming obese when given too much food and too little exercise. It’s not rocket science, but this is a good solid fact for any owner to know. Parrots kept in captivity rely completely on us to keep them bright eyed and healthy, so they are able to live long and rich lives, with no obesity related health issues. Therefore, a young, growing parrot living in an outdoor aviary in the UK will consume a lot more energy than an adult, non-reproductive parrot kept alone in a small cage in Florida for instance. When it comes to checking the size of your bird, getting hands on is key! Not all birds are used to being handled but it is difficult to judge if your bird is the right weight purely by sight. 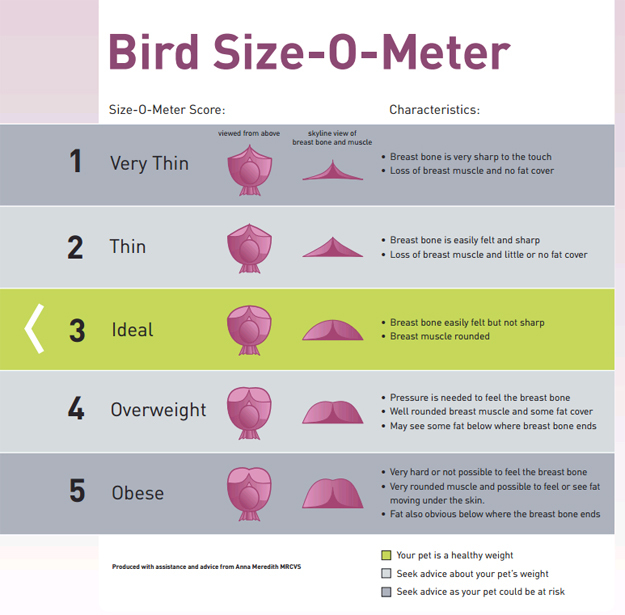 Here’s a great ‘Bird Size-O-Meter’ diagram from the Pet Food Manufacturers Association (PFMA) that you can use to help check whether your bird is overweight…or underweight for that matter. Most pelleted food contains lots of sunflower seeds to bulk them out. This contains more fat and protein than most parrots need, and the oils added to the pellets (palm and coconut oils) may cause fat deposits within the arteries. A better approach is to give your parrot a seed diet consisting of a wide variety of ingredients is best for your parrot. Known as bumblefoot, this is where there’s an inflammation or infection in the foot. The skin on the foot may be red and thin and as the condition worsens, ulcers may form…not pleasant. The first symptoms that you may notice are swollen joints in the feet or toes. The heavier the bird, the more weight and pressure it puts on its feet, resulting in the development of bumblefoot. This is aggravated by lack of flying. We know it’s stating the obvious but birds don’t put pressure on their feet while they fly, so birds that do not fly tend to be at higher risk of bumblefoot and obesity. You should seek veterinary advice if you are concerned that your pet may have bumblefoot, as the progression of this condition carries a poor prognosis. Any treatment must involve weight loss, padding the perches, and stopping the progression of the wounds with treatment, painkillers and perhaps antibiotics. The build-up of cholesterol crystals under the skin, known as Xanthomatosis, is and is more commonly seen in overweight budgies. The condition is usually seen on the tip of the wings, and produces a swelling that bleeds easily. In some severe cases, amputation of the wing tips is necessary and nobody wants that. Lipomas is the term used for a localised build-up of fat, again, commonly seen in overweight budgies. Once they have developed, it is unlikely that they will go away just with exercise and a low-fat diet. Therefore, surgery is sometimes performed to remove them. Atherosclerosis is the build-up of fat within the walls of the arteries, and it is common in medium to large parrots. This condition seems to be on the rise, and unfortunately its diagnosis is not easy. Affected arteries become less elastic and narrower, which can produce symptoms such as intermittent lameness, strokes, acute death due to aortic rupture, self-mutilation of the feet, etc. Atherosclerosis is more common as the bird ages, and it is very difficult to reverse. Interestingly, although it is very rare to see an obese African Grey Parrot, this species is particularly predisposed to atherosclerosis. 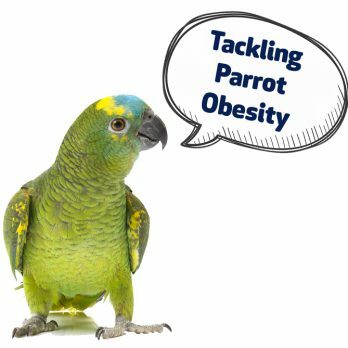 Other problems that can be seen as a result of obesity in parrots include fatty liver disease, reproductive failure, and developmental problems in growing chicks. Obese birds have difficulty flying and perching, and obese males may find it hard to chase the female and mate with her; in addition, large fat deposits on the abdomen can also interfere with copulation. An excess of fat, and particularly protein, in the diet of growing chicks can produce malformations and metabolic bone disease.